The NAM Retextures & Cosmetic Mod is a project based on revitalizing the original Maxis "vanilla" textures. It aims to portray greater realism, and to one day quantify all networks, as well as default North American and Euro sets, under one roof. dedgren coined the idea and created the first beta version (consisting of just the road network) which was showcased in his long term Mayor diary Three Rivers Region. 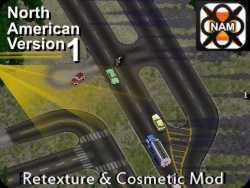 superhands subsequently fleshed out the idea to produce a full North American version of the mod, which was released on February 4, 2011. This mod has since been merged into the Network Addon Mod proper, as part of the Monolithic NAM paradigm introduced for NAM Version 31.0 in March 2013. Mandelsoft and riiga subsequently took up the task of creating a European version of the mod, which has also become part of the NAM itself. This page was last modified on 26 May 2014, at 07:42. This page has been accessed 12,768 times.